The DWC Series achieves accurate temperature and relative humidity using precise control of the chilled water flow rate and air flow rate across the chilled water coil. 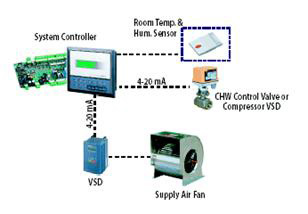 The DDC in-built fuzzy logic controller is used to track and monitor all key parameters achieving the desired temperature and humidity set-point. The DWC Series achieves its precision by varying the water flow rate and air flow rate through the chilled water pipe. Looking at the relationship between sensible heat capacity and latent heat capacity curve as shown in the diagram, the exact amount of humidity to be removed by the DWC system can be controlled precisely by changing the air flow rate or water flow rate. The former can be varied using a VSD and bypass damper while the latter can be adjusted using the chilled water control valve. The VSD and chilled water control valve are precisely controlled by the Enercov DDC Fuzzy Logic Controller. As a result, an accurate room temperature and humidity can be achieved without the additional heating devices, desiccant wheel, heat pipe, or other compensation devices. Power consumption is reduced by more than 50% as compared to the conventional system*. The system solution has a lower Total Cost of Ownership (TCO), maintenance cost and monthly running cost as compared to the traditional technology. Our DWC Series can achieve a room temperature error of less than +/-1.0℃ and humidity error of less than +/-5%RH of the desired controlled range*. The specification is robust enough to implement the Enercov DWC in semiconductor, precision manufacturing, bio-technology and hospital environment.